This Blue Buffalo Puppy Food Review will look at one of the of nine different products made by this company, each either catering to large or small breed puppies, or promoting a different protein source. I was asked to review Blue Buffalo Puppy Formulas by Sara from MN, USA. Many foods have already been reviewed by Small Dog Place, however, if you do not see your own food, you are welcome to submit a review request and we will review your food as time permits. Since I did not have access to the actual packaging, I went directly to the Blue Buffalo website where I found the information I am providing below. I analyze dog foods based on the system developed by Sarah Irick's Rating Scale which provides a number and letter grade based on an analysis of the ingredients in any type of food. 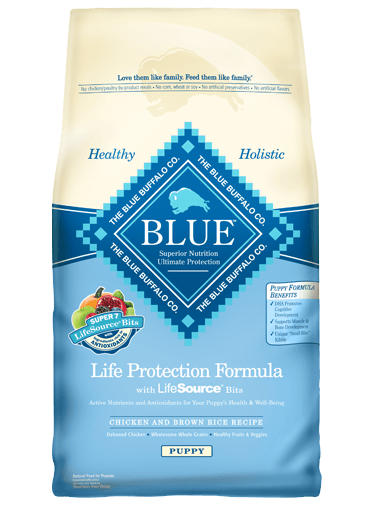 For the purposes of this Blue Buffalo Puppy Food review, I examined a couple of the Life Protection Formulas, the Puppy Chicken & Brown Rice, Puppy Lamb & Oatmeal and the Small Breed Puppy Chicken. Since all three of these foods are relatively similar and all came out with the same score, I have clumped them together as a group. The following information for this Blue Buffalo Puppy Food Review is provided on the Blue Buffalo website. BLUE Life Protection Formula Natural Chicken and Brown Rice Recipe Food for Puppies is formulated to meet the nutritional levels established by the AAFCO Dog Food Nutrient Profiles for growth. Remember, I base my analysis solely on the ingredients and not on other factors. To complete the analysis, I did a quick search and learned that as of this writing (January 28, 2015) there are a number of negative comments made by dissatisfied customers. Many consumers complained of gastrointestinal complaints—soft stools, diarrhea, increased thirst, hair loss, and general malaise. Some even mentioned renal failure and death. Consumer Affairs had the most negative reports. Amazon and Reddit Dog also had a few negative comments as well. On Reddit Dogs, There were comments from people whose dogs and cats either loved the product or had no problems. This also seemed to be the case with customer reviews of the products on Amazon. Are Blue Buffalo products tainted? I looked for recalls. There have been no recalls. Are they reporting ingredients honestly? Well some say no, and evidently filed a lawsuit against the Blue Buffalo Co. Who would do such a thing, you might ask? It appears that a competitor did, Nestle Purina. So, what about all the negative comments? Take a close look and you will see that they are all well written, spell checked, and grammatically correct. You normally do not see this on a typical forum. Did professional writers write these comments? I was intrigued, so I went back to Consumer Affairs website and did a quick search for dog foods. On just the first four pages, there were literally hundreds of complaints about Canidae, Natural Balance, Ol’Roy, Purina, Diamond, Kirkland, Iams, Eukanuba, Beneful, Pedigree, Nutro, Hills, and Royal Canin. I had to stop. Nevertheless, when you are investigating a particular food, negative comments have profound effect on our ability to look objectively at the product. Most people do not take the time to make lengthy comments about how much they love a product. Negative comments will invariably outnumber anything positive. After doing this Blue Buffalo puppy food review and looking at comments made by others, I still maintain that the product is superior to many other similar foods currently on the market. The ingredients in these pet foods are superior giving them an A+. Few ingredients are considered harmful, unhealthy, or just filler products. There have been no recalls and the product is made in the United States. I think these factors are enough to recommend this product. Would I use Blue Products? 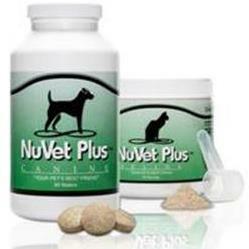 Personally, I have used the puppy and adult formulas for my dogs in the past. (I currently have 15 dogs). It was just a little too costly to use as the main source of food for my herd of dogs. 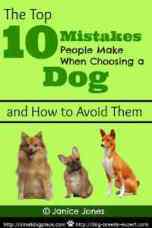 My dogs liked the taste and ate it readily, but a couple of them did not. My dogs did not suffer any adverse reactions from eating the Blue Buffalo products I used. However, I do use Blue treats for training and Blue Buffalo and Blue Wilderness Canned Foods for added taste and nutrition when combined with my dry food. Blue Buffalo Puppy Formulas are available in 6, 15 & 30-lb. bags. You can click on the image below to be taken to Amazon where you can check them out yourself. Would You Like a Dog Food Review? Please provide us with as much information as you can about your dog food and we will take it from there.